Is this Van Dyck’s Coat of Arms? JVDPPP is studying the small grisaille portraits on oak panel that relate to Van Dyck’s ‘Iconography’ – a series of engravings depicting the famous men and women of his day. 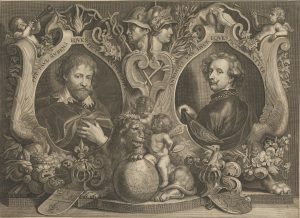 Sometime after their deaths in 1640 and 1641 respectively, Erasmus Quellinus (1607-1678) designed a double portrait of the ‘princes of painting’, Rubens and Van Dyck. The faces were derived from Van Dyck’s ‘Iconography’ and the engraving was executed by Paulus Pontius (1603-1658). Pontius had also produced some of the engravings for the ‘Iconography’. Rubens and Van Dyck are described as ‘Eques’ – Knights. Both were knighted by King Charles I, in 1630 and 1632, and Rubens was also knighted by King Philip IV of Spain in 1624. The coat of arms on the bottom left of the engraving belongs to Rubens. It was published by W. Nöel Sainsbury in 1859 in his Original Unpublished Papers illustrative of the life of Sir Peter Paul Rubens. The legend states that the coat of arms was certified at the Heralds Office, Brussels. 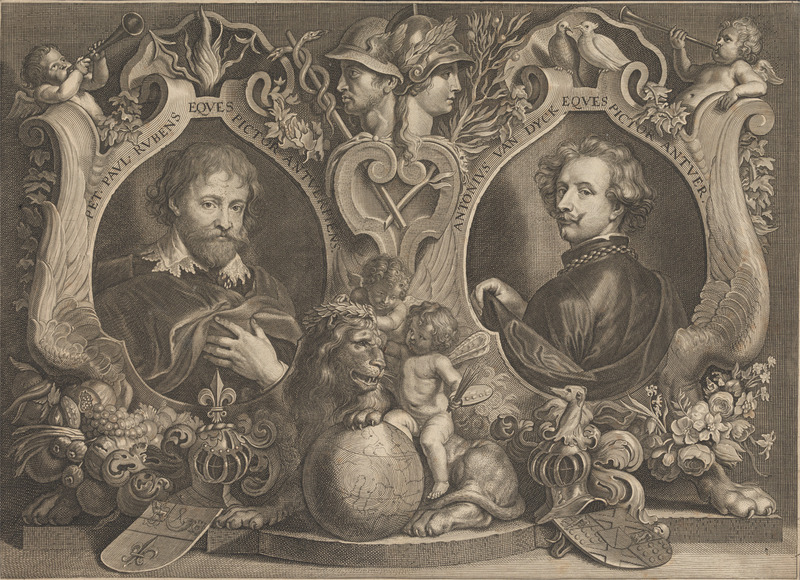 Therefore, it is possible that the coat of arms on the right of the engraving belongs to Van Dyck. It features only in this print and has not been published elsewhere, as far as we can find. Delving into the archives of the Brussels Herald’s Office to confirm that it is indeed Van Dyck’s coat of arms will be one of the projects for our new Archival Research Fellow (to be appointed soon). P.S. The eagle-eyed will immediately spot that the arms contain two saltires (diagonal crosses) and that a saltire featured in the arms of Van Dyck’s friend, George Gage. It can be seen on the column in Van Dyck’s George Gage with Two Men painted in Rome ten years before he was knighted and now in The National Gallery, London. Update: It is Van Dyck’s coat of arms! 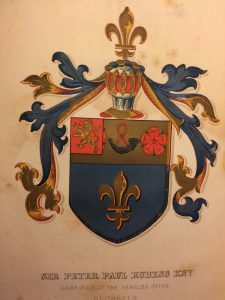 Thank you to Karen Hearn for sending us the description, and to Norroy and Ulster King of Arms for confirming that the description matches with the engraving, contained in Michael Siddons’ The Heraldry of Foreigners in England 1400-1700, 2010, p. 123. We will now try to find the original application and colour design in the archives. ARMS: Quarters 1 & 4. Azure six roundels 3, 2 and 1 Or and for augmentation on a chief Gules a lion passant gardant Or. 2 & 3. Sable a saltire Or. Over all an inescutcheon Or thereon a bend sinister Azure. How to cite: Davies, Justin. “Is this Van Dyck’s Coat of Arms?” In Jordaens Van Dyck Panel Paintings Project.